I’ve been struggling to make progress on my preparations for the NMRA National Convention. 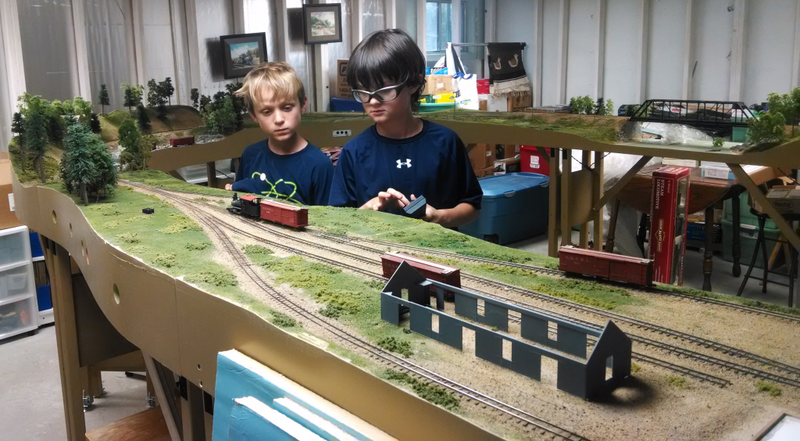 But when my son and his buddy Clarke expressed interest in the trains I made every effort to give them an enjoyable experience. I think they got interested when they heard me testing a TCS WowSound decoder (sadly, not in a locomotive….but that is another story). I told them they could run a loco but without sound, but that did not seem to damper their enthusiasm. After a short time, I got them setup up with my WW&F #7, a few cars to couple and boxes to stand on. They then connected the three cars and started the train around the layout. When they got to South Strong Junction, I challenged them by suggesting they drop off the middle car from their train. It was fun to seem their brains go to work after they dropped backed into the siding with all three cars….But like olde heads or was it an old married couple that did not give up and go the job done. The moment only lasted for 10-15 minutes, but it was the highlight of my weekend. They are only nine once…So I try to take it in! Here is a photo of the Sn2 Kids in action. Great photo Dave… Glad to see you working in Sn2 again. Your son looks just like you!